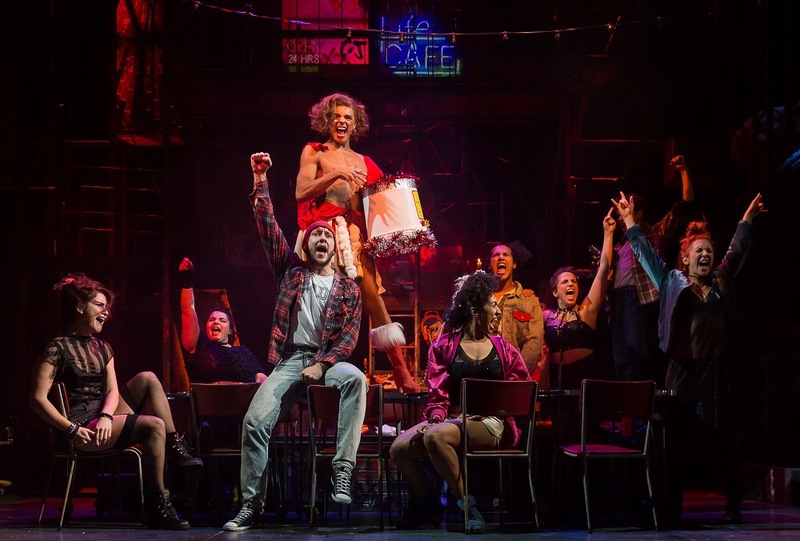 We Are Chester’s Sophie Francis and James Wright went along to Theatr Clwyd, just over the border from Chester, to review the 20th anniversary production of Jonathan Larson’s award-winning musical, Rent. And the performance left such an impression on our writers that they have both written reviews for us. In our first review, find out why Sophie found it an incredibly moving experience. I’ve always enjoyed going to the theatre. I don’t remember my first visit, but I will definitely remember this particular visit to Theatr Clwyd in Mold. Today I took time to look up from my busy life and to soak up the atmosphere in this gem of a theatre. On entering the reception area, I enjoyed a cuppa at what was a reasonable price for a reasonably good brew, considering it was a tea bag in cup job. I really didn’t know what I was in for. Admittedly, I’d never heard of this musical before but I was intrigued by the one word title. They say ignorance is bliss – in this case, I’m inclined to agree. We got our tickets, took a quick selfie (how could we not), and took our seats. Memories of previous visits to that same theatre flooded back, even the smell of the ever-filled seats, and the low mood lighting. Somehow time stood still, and then at 14:36 I was transported to New York’s East Village and to a world of art, culture and bohemian origins. I can safely say that after experiencing the sights, sounds and emotions of this epic Pulitzer Prize and Tony Award-winning musical, it truly is a must see, and is especially fitting doing so in what is their 20th anniversary year. Two words sum it up for me – emotional rollercoaster. From start to finish, I was overcome with seriously strong feelings – love, anger, amazement, bewilderment, joy and sadness. Tears rolled down my face, from sheer amazement at the vocal talents of the cast. Two stood out. First is Angel (Layton Williams), a trend setter and drag queen, who shone bright like the star she is. Taking hold of the group of youths struggling to pay the rent to their former room-mate, she takes us on an emotional journey of love, respect and having each other’s backs. Second is Jenny O’Leary, who turns her hand to a number of roles including mom, but her stand out moment for me was her solo in Seasons of Love. Her depth, range and tone and her unbelievably incredible voice make her stand out. Tears streamed down my face from the first note, and continued, my sleeves soaked through like I’d been caught in the rain. Never have I seen a musical with such charisma emanating from the stellar cast. From the moment I sat down I was taken aback by the design of the set. Placed on a backdrop on what looks like old scaffolding, it is actually depicting an apartment with a sofa, a coffee table and one extension lead powering everything. Throughout the production, the set plays host to every scene, changing only minimal items. Decorated with old posters, a stained glass window, graffiti and lights of all sizes, it truly gives the bohemian look it strives to depict. Rent is dripping with sexual innuendos, put forward through music and comedy. I’m not going to lie, this is among the best musicals I have ever seen, and, believe me, I’ve seen a lot. Rent runs at Theatr Clwyd until 12 November, prior to a three week national tour and then a Christmas season in the West End.